A mod to make Minecraft very slightly less infinite. THIS MOD IS VERY MUCH IN A WIP STATE. AN UNSUPPORTED RELEASE IS AVAILABLE FOR MC 1.7.10. Minecraft is pretty near infinite in many ways. This also applies to fluids. This mod makes these fluids less infinite, and gives them more realistic behaviors. Each block of fluid can contain up to 1000 liters of water (265 gallons), and this is it. If you put a fluid in the air, it will fall down. If you put a fluid on the ground, it will make a puddle. If you make a hole in the bottom of the ocean, it will drain out into the void. This mod is currently a work in progress. There is an early alpha/proof of concept build available for 1.7.10, but this is not supported. I am currently in the process of rewriting the entire mod from the ground up. Currently working on: bug fixing and cleaning code. Unfortunately I don't have any screenshots (yet. I've just never gotten around to it). However, a guy called PMunch did make a video from one of the earlier alpha/WIP builds, and while this version of the mod was by no means complete, it should give you a good idea of what the mod hopes to achieve. The mod is currently in a WIP/Proof of concept state. As such, there is no final build just yet. However, I did build a .jar from the early codebase. This should be considered as an EARLY ALPHA BUILD, and should not be used in any important worlds without backing them up first (it can make permanent world changes that can't be undone). PLEASE NOTE: This download is early alpha and mostly unsupported. It should kind f work in survival playthroughs, although there may be some issues with other mods. The mod makes permanent changes to the world, and as such; you should always back up your saves. Furthermore, this is a rough proof of concept and comes with no guarantees of any kind. If it crashes, you are on your own. I have read the above disclaimer and am ready to download it. This being said, his version is not necessarily stable or bug-free, and a similar disclaimer should also be applied (unless he says otherwise). The mod and its source code are licensed under the GPLv3. The source code for the older builds of this mod can be found here while the source code for the newer versions of this mod can be found here. Water mechanics, flow, equalization, etc, along with the update scheduling system and most of the necessary tweaks to fix "cave flooding". I still need to optimize, investigate some more equalization methods, optimize some more, tweak the terrain gen some more. After that, I will start working on things like pumps and pipes, getting them working with inventories and mods. Finally, I will work on other fluids, such as Buildcraft oil. when your done with the liquid physics could you release it? because after that it will be just as good at finite liquid! 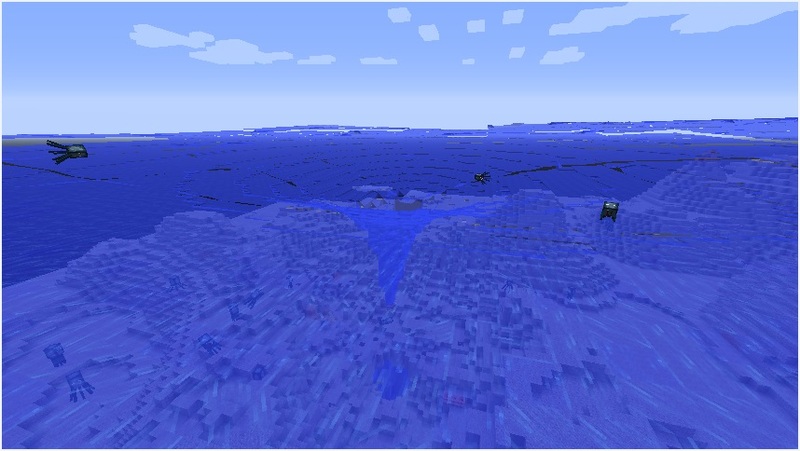 @Bijuu Unfortunately I don't think this sort of thing will make it into the vanilla since it is quite a drastic change and removes some of the more famous aspects of water in Minecraft. On the other hand, I have a few ideas which will hopefully give water some new uses, while retaining many of its old uses (for example, use a pump to fill a tank, then emptying the tank to harvest crops). When I am done with getting the standard fluids working even better, and have some primitive uses for them (aka buckets that work properly), I will consider it beta-worthy. The biggest problem right now is basically that the bottom of the ocean is filled with holes, and while this doesn't exactly lag the game, it really isn't good when most of your river is at the bottom of a ravine. UPDATE: It seems like I will be at beta sooner than I thought. The changes to update scheduling and equalizing went so freaking brilliantly... man... It left me speechless. With the equalization tweaks, oceans can flatten out at incredible speeds, so fast, in fact, that the earlier problem of underwater caves might not actually matter at all (thanks to some changes to the scheduling system; distant chunks simply get updated less often than near ones, and do not get updated at all if the system is under too much load, meaning that the distant deep sea updates simply get skipped if they would cause lag). Unfortunately they currently only look like whirlpools :'( That is to say, the current points directly to the center. I might look at making it spin, but the calculations will be rather on the extreme side and I don't know whether it will be feasible (since whirlpools are created by inertia [and some friction] as the planet spins, every block will need to conditionally check where it is in the world, calculate an inertia vector, check the vectors of the neighbors, etc. Maybe as a PoC plugin one day, but I doubt it will every be a part of the main package)). On a different note, I'm looking into using a different threads to perform some of the calculations, long range equalization in particular. Will probably need to rewrite a lot of the back-end stuff, but w/e, experience says that it will imrpove performance significantly, and more importantly; make for a better playing experience as calculations won't delay the server thread. I imagine getting the water working with buckets would also be a similar thing to getting it working with pipes yeah? Like some kind of "wrapper" or "converter"? The way I'm planning it, ~my~ buckets and pipes will store a condensed amount of fluid (basically, I'm using 16'000 fluid levels per cell atm, but instead of storing up to 16'000 levels per pipe as a tile entity, I plan on storing 16 levels per pipe in the metadata of the block, where 1 metadata is equal to (maxFluid/16) fluid levels, noting that tile entities should be avoided wherever possible in general lol). I want to make my own pipes because other pipes won't let you spray the water out on the ground and stuff. For pipe compatibility, I'm not really sure what I will do yet. I will have to look at how the pipes and pumps work in other mods before making a decision, but atm I think I will probably just end up making my own pump that can output fluids into regular pipes, as well as my own pipes which will be able to pump fluid into inventories. i cant stop smiling! also, the whirlpools dont have to spin! it would still be fun! Well, w/e, I decided to just link the source despite some of it being hacky/temporary/etc. Feel free to take a look @ anyone who is interested. Also, finished threading stuff. Still need to REALLY test it HARD, but it seems pretty sturdy and quite a lot faster as well. Last but not least: Added a very simple current system, meaning that blocks below the surface can now move the player around. Very promising, And I'm sure in 1.8 the performance optimizations will make this mod work wonderfully. I would like my hands in the Closed alpha. This looks really cool! Can't wait till it's released! I would like my hands in the Closed alpha. @1.8 Mmm, it should make life a lot easier. So will +6months of computers getting better. Performance is a massive concern for me, and when you are dealing with hundreds of thousands of blocks at once, a tiny inefficiency in the wrong spot can really slow things down. On a different note, the threading changes are stable. Now the mod attempts to use the server thread for general stuff, along with one thread for "rapid equalization", one thread for priority updates, and one thread for trivial/distant updates. Four threads of squid destroying power. Unfortunately this will not hugely benefit less monstrous systems (aka 5 year old single core Pentium laptops) running on "tiny" view distance (as a CPU has a finite number of clock cycles, more threads will only help to distribute load and jitter a little bit), but it will work significantly better if you have a few spare cores in your rig.